FT33 and Flora Street Cafe now offer a three-ring circus of vegetable delights. Let's take the taste test. Two of the city’s top chefs, Matt McCallister of FT33 and Stephan Pyles of Flora Street Cafe, have become vegetable-reverent ringmasters. Treat their seasonal vegetarian tasting menus like a three-ring circus where you get to simultaneously witness all of the magic. Between the innovative ingredients and technical fireworks, you won’t miss the steak. The Fixe: Even if you are dining with carnivores, you can opt for the four-course prix fixe menu and choose the vegetarian dishes ($75, plus $55 for optional wine pairing). The Ethos: McCallister’s specialty: rustic-chic, with hyper-local sourcing and complex flavors from pickling and preserving. The Junk Food Tribute: In a vegetal version of taquitos, shaved kohlrabi is brined, filled with a mixture of crème fraîche and cow’s milk El Dorado cheese, rolled up, and dusted with kale powder and toasted benne seeds. The Surprise Element: In the toasted rye tagliardi, sheets of rye pasta slip in a compound butter made with sauerkraut and preserved lemon. The rye and caraway seeds are patiently toasted in a pan for an hour for the pasta. It’s a perfect rye-caraway marriage. The Best Use of Foam: A creamy, aerated Parmesan Mornay piped around house-made ricotta gnocchi is like a cloud of béchamel. Caramelized fennel and a “cracker” of toasted cheese complete the picture. Take It Up a Notch: Use the vegetarian tasting menu as a chance to sample sommelier Mychal Trujillo’s collection. Try a Vin Jaune, a wild wine with bitter gentian notes, or a Pinot Bianco with terrific acidity that plays with vegetal companions. Flora Street Cafe’s whimsical heirloom carrot amuse-bouche. The Fixe: You’ll need to convince your whole table to commit to the elaborate 10-course vegetarian tasting menu ($95, plus $100 for optional wine pairing). The Ethos: Visual theatrics and Texas ingredients come together in playful, creative forms. The Junk Food Tribute: A tiny empanada is filled with the savory corn fungus huitlacoche, and topped with dots of guava gelée and corn pudding. 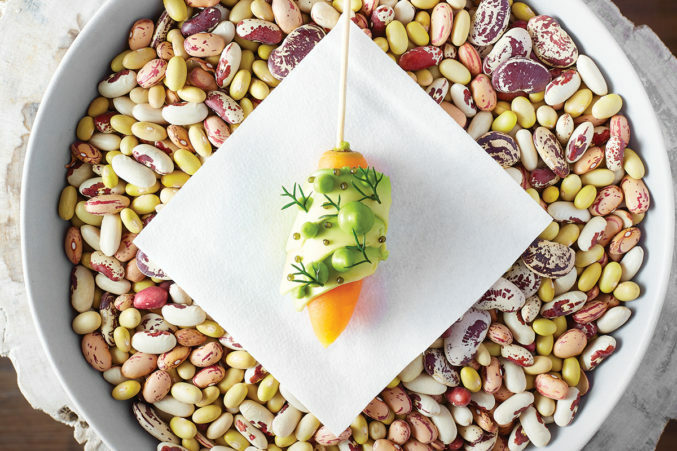 The dainty finger-food morsel rests on a bed of multi­colored dry heirloom corn. The Surprise Element: A winter salad composed of hibiscus leaves from a farm in Ohio and crimson-veined baby radicchio is topped with burrata, yogurt sorbet, pickled beets, pomegranate seeds, and cocoa “soil.” It feels like a walk in the woods. The Best Use of Foam: In a variation on the jasmine-essence scallop dish, dry-ice mist spills around a clear glass bowl that holds jicama, coconut flesh, and mango topped with a passion fruit vinaigrette. Take It Up a Notch: As if 10 courses aren’t enough, the meal isn’t over until the mignardises arrive—a parting gesture from the kitchen. House-made chocolates with Jackson Pollock splatters include flavors like Fig Newton and maple-bourbon.